Can’t-miss May event: Horns of Plenty! Whether you’re a beginner transitioning to intermediate music, a professional player looking for a better horn, or joining marching band next fall, if you play a band instrument, mark your calendar for May 19th! Music and Arts is holding a HUGE event that day, and wherever you are with your instrument, you won’t want to miss it! Who: Music and Arts, your number one source for all things musical! The company and its local employees are proud to present: Horns of Plenty! What: Horns of Plenty is the largest instrument event in New Jersey, with a wide selection of instruments from a wide variety of brands, all in one place! Attendees can try them out, speak with experts, and get incredible pricing on the best horn for their needs. It’s the perfect way to find the ideal instrument for you or your child at the best possible price! Where: This event will be held at our Paramus store, conveniently located right on Route 17 North. If you’ve been there before, great! If not, get excited for an awesome experience, and set that GPS to 762 Route 17 North in Paramus, New Jersey! When: Saturday May 19th, from 11:00am to 3:00pm. Make your appointment TODAY, as spots are filling up quickly! Why wait on line, when you can be helped right at your appointment time, without missing a second of the fun? Having an appointment will make your experience as smooth and efficient as possible! Why: Did we mention incredible deals on hundreds of instruments?? In case you’re still on the fence, let’s break that down. This event will feature two awesome promotions: 10% off purchases $199 and up, plus free 18-month financing with no money down! And yes, you CAN use rental credit if you have it! 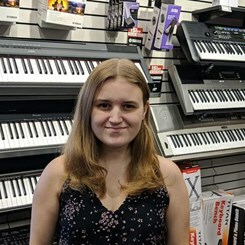 All qualifying customers can use these amazing offers to purchase their ideal instrument, after trying out as many as they like from our huge selection. What more reason would any musician need?! If you have ANY questions about Horns of Plenty, please don’t hesitate to ask! All of the employees here at the Ramsey location are always more than happy to help! Call or stop by, before this exciting event, so you’re more than ready to get a great instrument!